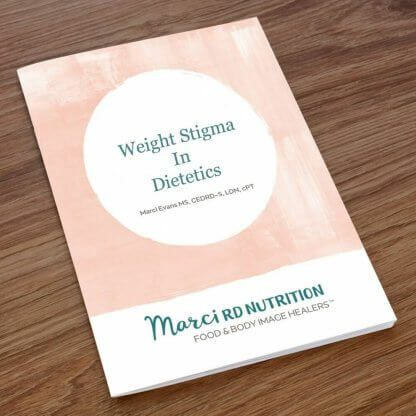 Weight Stigma in Dietetics Practice - Marci R.D. As dietitians, we entered the field of nutrition to help people live healthier. It is at the forefront of the work we do. But how would you feel if you knew that your personal beliefs and attitudes were negatively impacting the health outcomes of your clients? How would you feel if you learned that your clients’ beliefs and attitudes about themselves were also a major risk factor for poor physical, psychological, and emotional health? I would imagine that you would want to do anything in your power to improve your client’s health rather than jeopardize it. The purpose of this article is to clearly define weight stigma, identify how it impacts your perception as a clinician, and provide concrete tools to help you combat weight stigma in your nutrition counseling work.